What could be at the bottom of the barrel of Nintendo's failure of a console? 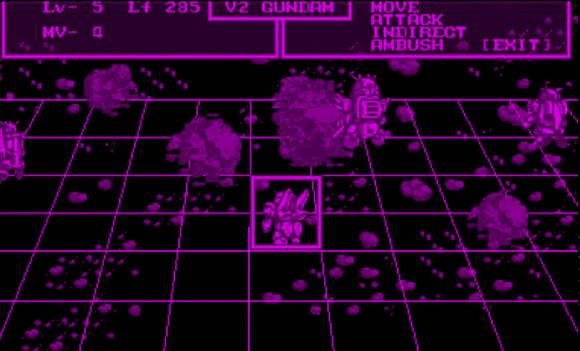 This Gundam game is what! The reason why is that this turn based strategy game requires almost no strategy, contains almost no story, and amounts to an overly simple series of repetitive and easy battles that go on for a few hours before ending in a predictably unsatisfying way. This is what you get when you decide to make a turn based strategy game, but then stop at the most basic level. It's hardly even a game and certainly not a fun one. 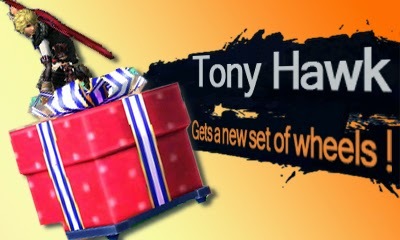 There's no reason for anyone to play it. It's not so bad it's good, it's just bad and boring. Once again, the problem here is the unforgivable simplicity. You can choose to be a boy or a girl (which makes no difference in the gameplay), change the weight of your bowling ball, and the strength and direction of your throw, but figuring out the winning timing is simple. Once you've got that, all there is to do is play games against yourself and go for high scores or practice in challenge mode with preset configurations of pins set up. That's all there is to the game and there's really no incentive to do any of it. There's nothing wrong with high scores exactly, but since it's bowling, the highest possible score is easily attainable. 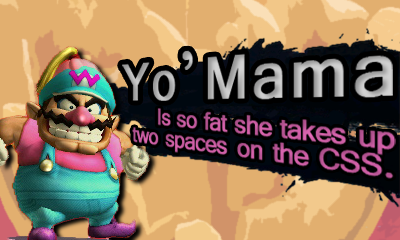 There's really just not much to this game at all. You know Space Invaders, right? 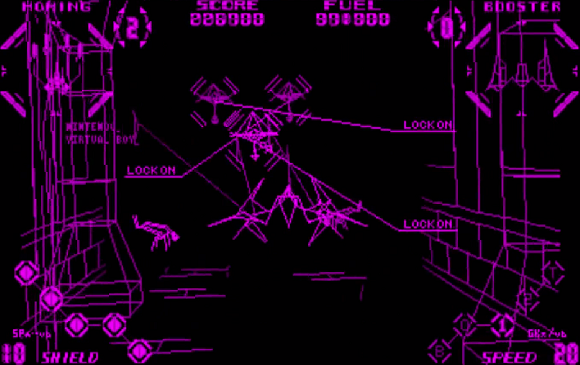 It's the old arcade game where aliens go back and forth down the screen at them and you shoot them. 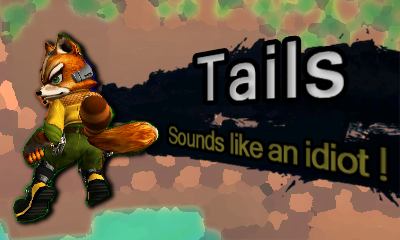 Well, that's what this is, but now you can play it in 3D. Or the original style. Or play challenge mode and go for a fast time or high score in a time limit. That's all there is to it. It's the same old Space Invaders without much we haven't seen before. Unless you're a fan of the old arcade game, you'll be bored in minutes and have no reason to go back. According to Wikipedia, Waterworld is considered by many to be the worst game on Virtual Boy. Obviously, I disagree, but I'll admit that it's pretty bad and for the same reason as most of the games on the console: it lacks content. It's basically an arcade style game where you drive a boat around in a 3D ocean containing drowning people and various debris in the center. Your goal is to defend the drowning people from jetskis that race in and try to drag them out of bounds. You do this by shooting and bumping into stolen guys to send them back to the middle. You lose by having all your guys stolen or by crashing into the jetskis too many times. It's actually not that terrible, but it's not all that fun either. It just goes on forever and you have to try to keep going as long as you can. It would've been better if it had more complexity or other modes, but instead it just throws you right into the game or right into the credits when you die. It's a decent concept, but unpolished. It has really good, chill music though, reminiscent of the underwater music in Donkey Kong Country, so that's a plus. Also, why is the goal to keep the drowning people from being saved? This one's a fairly unique puzzle game. 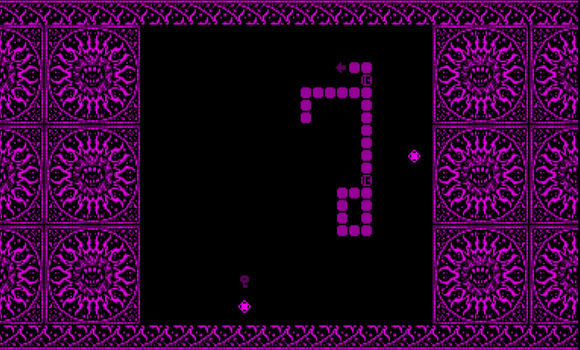 You get intestine-looking pieces which fall down and the goal is to connect them strategically so that all the open ends get capped with an end piece or an edge of the game area. It's a cool idea and starts out working well enough, but as the endless levels go on, the field will start with more and more pieces which tend to be in unsolvable configurations. By around level 20, the game devolves into resetting until you get an optimal setup that you can actually solve. Even when you have a solvable setup, finishing, which is done by clearing all the tiles in play, puts you at the mercy of the game's random number generator since you'll need specific pieces at just the right time. It's almost good, but then it's not due to these oversights. Oh, hey! It's another bowling game! This one is better because you can adjust your throw in a couple more ways, change the slipperiness of the alley, use different throw types, and compete in a multi-game tournament with computer players with an actual ending! However... you don't really need to worry about all that extra complexity in throwing because you'll eventually figure out the one strategy that works every time. Then you just do that over and over until you're done. 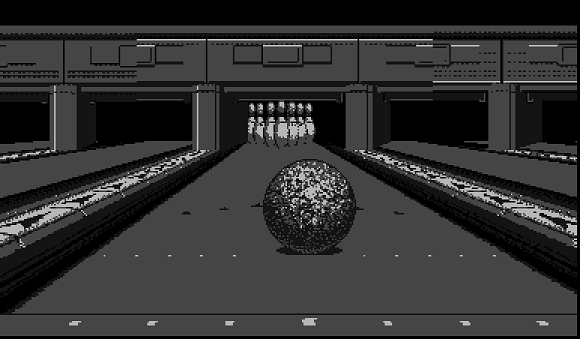 And that's Virtual Bowling. 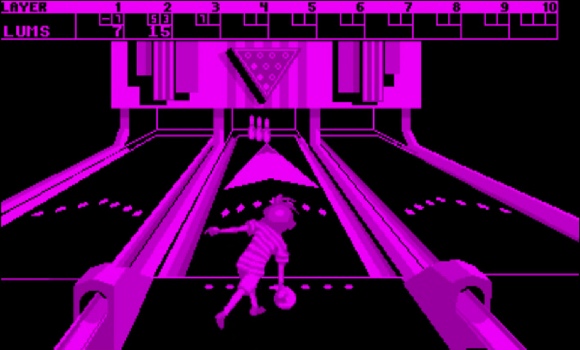 This one does have better 3D graphics than Nester's Funky Bowling as well, although they glitch out a bit on emulator (many Virtual Boy games have glitchy graphics on emulator), which is why this screenshot is different. 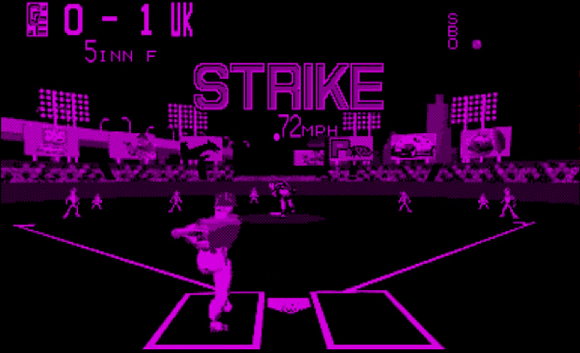 Since I haven't played many baseball games, it's hard for me to say how this one compares to others in the genre. It's what you'd expect though; you can do all the usual baseball related things and play through a league of eight games or just play a single game. It uses a password system for the league games, which isn't as great as normal saving, but it's better than nothing. Unfortunately, like Virtual Bowling, there's a winning strategy that will almost guarantee victory. Utilize that, and it's just a four to five hour sleep-inducing waiting game. In this one, you participate in several different fishing tournaments, each with different fish and locations. 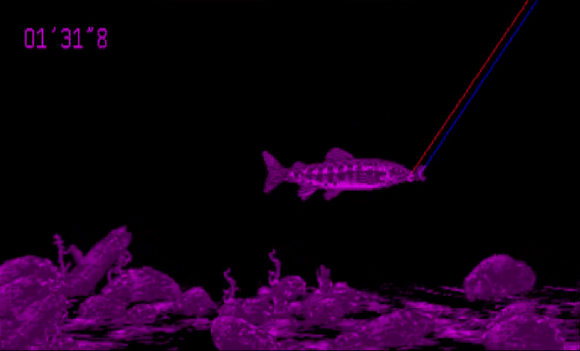 In each competition, you have eight minutes to catch the most fish adding up to a total length higher than your computer-controlled opponents'. Each variety of fish has a different timing for when you need to yank the rod, but since each competition has only one kind of fish, it's an easy win once you figure out that particular timing. To hook a fish in the first place, you just cast and reel in until something bites. You can also change your lure, but it doesn't seem to make much difference. When you do actually get a bite, the game switches to an underwater view where the goal is to reel in the fish further whenever it isn't fighting. If you reel too much when it's swimming away, your line will break. It seems like a decently enjoyable game, but it quickly becomes mind-numbingly easy after you figure out how to play. It may have Bomberman, but Panic Bomber is just your standard match-three-falling-blocks puzzle game. Not that that's a bad thing. 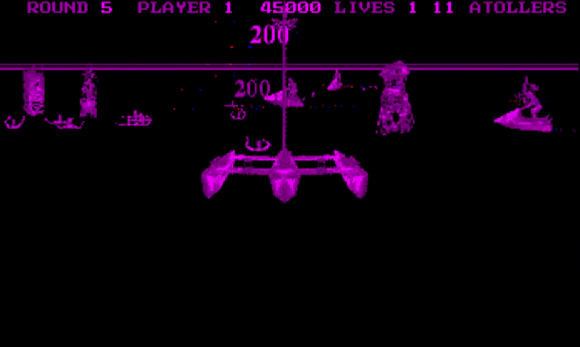 The game has you playing alongside a series of computer-controlled opponents as you try to arrange your falling sets of tiles (or animal faces) so that three of the same shape line up. Getting a match causes bombs to appear at the bottom of the play area. 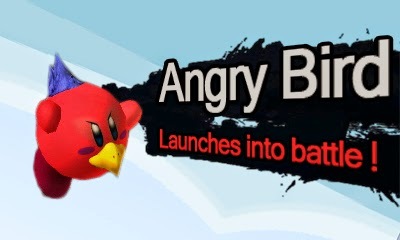 These bombs can then be detonated by the occasional lit bomb, sending a flood of blocks over to your opponent. It's not terribly innovative, but fans of puzzle games will enjoy it. 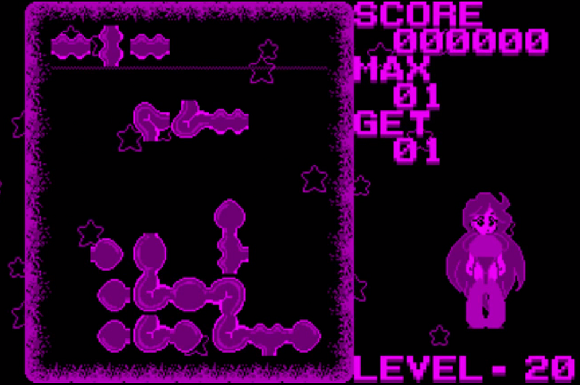 It's not very long of a game, but it does have four difficulties, so that's something. If it counts for anything, I actually enjoyed this game more than several of the games ranked ahead of it on this list. It's just not technically that impressive or innovative or long. Well, in Golf, you hit a ball with one of your choice of clubs and try to get it in a hole. 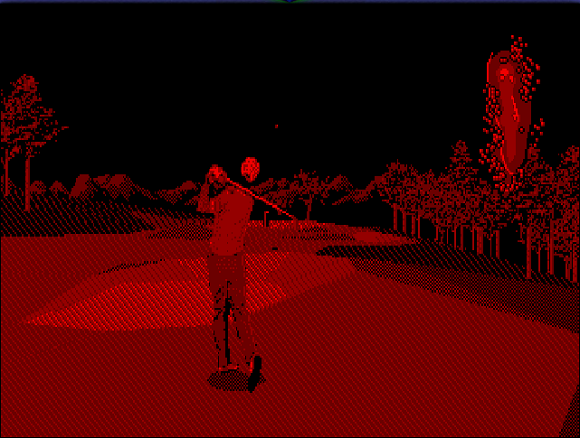 You can adjust your stance and swing strength and try to get the best score over an eighteen hole course. It's harder than it sounds because there isn't much room for error, the computer players are also quite skilled, there's variable wind to account for, and part of the swing which determines where in the ball you connect is extremely difficult to time correctly. This game also uses a password system, so if you really want to win, you can reset and re-enter your most recent password until you can finish the hole with an acceptable score. It's not bad, but that where-to-hit-the-ball thing is extremely frustrating and makes the game much more difficult than it needs to be. On the one hand, Tetris is a fantastic game that I'd rate very highly in general, but on the other hand, it's hard to rank this too highly since it does very little that's new and different from past versions of Tetris. If you've played more recent Tetris games, you'll be disappointed that this one does not have many of the modern Tetris features and is pretty bare-bones. 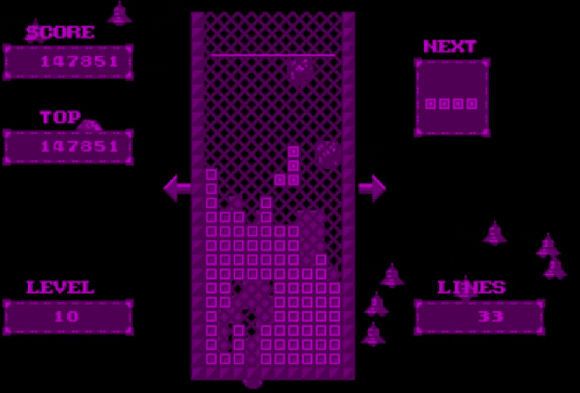 V-Tetris offers three modes: ye olde endless Tetris, line-clear Tetris (where you have to clear a certain number of lines to progress to the next level and start fresh again), and an actually new mode where you can push the blocks around the back of the playing area, essentially having two play areas at once. That new mode is actually pretty interesting and unique and worth checking out for fans of Tetris. Otherwise, there's not a whole lot to this game. 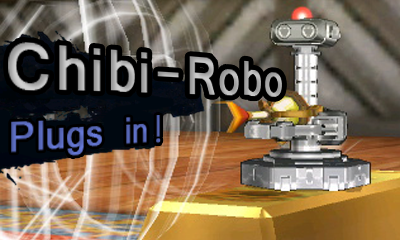 Complainers about Nintendo only rehashing old franchises, this one's for you. If you aren't familiar with Nintendo's "Art Style" series on Wii Ware and DSi Ware, it's a darn shame, but that's why I'm here. Games in the series tend to be simple, but cleverly designed and a blast to play. They're the evolution of the Japan-exclusive "bit Generations" series on Game Boy Advance, and almost every entry is worth your time (although, I'd argue that they went downhill as time went on). I've played most of them, and out of those, Orbient was by far my favorite thanks to its enjoyable gameplay and extensive amount of unlockable levels. 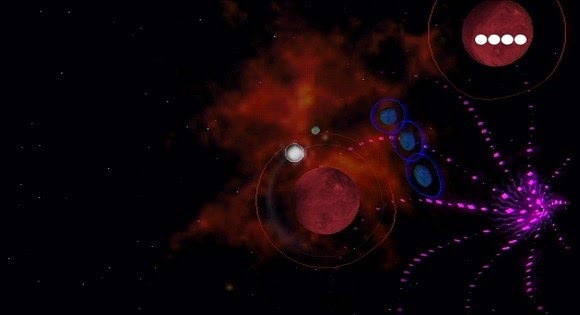 Orbient plays out somewhat like Katamari Damacy in space. You're a planetoid and you float around absorbing smaller planetoids to get bigger. As you grow, the other celestial bodies change color to indicate whether or not they're absorbable. Unlike Katamari though, only the next size up of planetoid will allow you to grow; smaller ones will just be absorbed for no benefit. 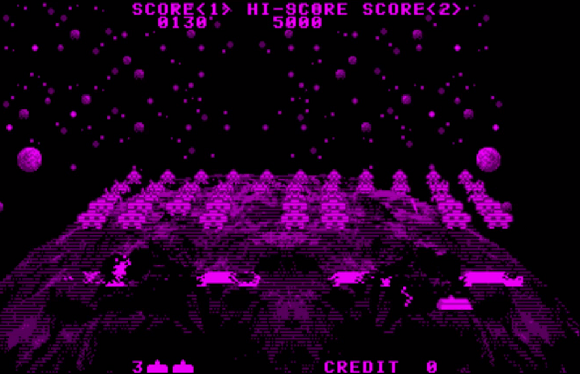 However, that's where the titular orbiting comes in: Your end goal in each level is to get big enough to get the sun to orbit you, but along the way you can also get smaller planetoids to orbit you by drifting near them. 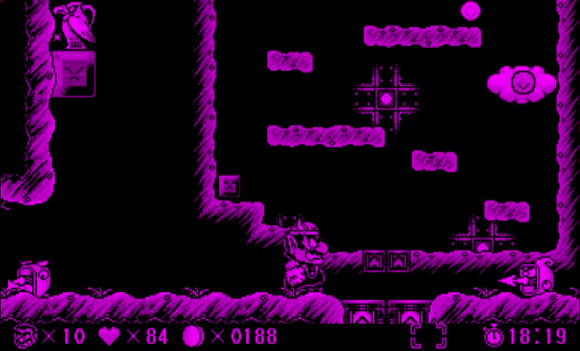 Each level also has a moon to go after as an added challenge. 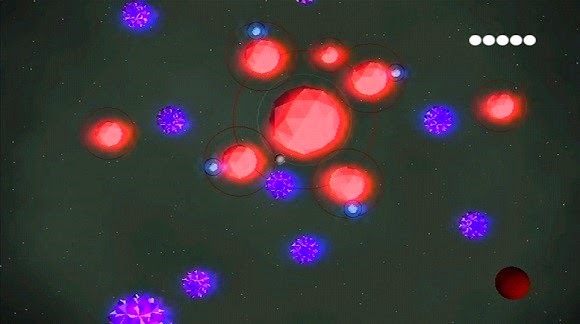 With each added satellite, the game's minimalist music builds and grows more complex (although, unfortunately, capturing the moon resets it all to unique moon-orbiting music). Getting all the moons will unlock extra difficult levels, while having other planetoids orbiting you just nets you extra points and lives. Each level tracks your best score and time, so high score seekers and speedrunners could find added replay value there. Obstacles without gravity which can't be absorbed or captured also get introduced later on. So that's the game's goal, but the way you control your movement makes Orbient even more unique. Rather than just flying around wherever you want, you can only influence your momentum by pressing A or B to either draw yourself in or repel yourself away from nearby planets according to their gravitational pull. This creates a somewhat slow-paced, but satisfying and challenging method of control. It's also possible to lock into the orbit of a larger planet by drifting past it, allowing you to easily move in and out within its orbit and then break free at just the right angle to slingshot to your next destination. Orbient's movement and controls work well almost all the time, but in situations with many surrounding planets, it can be hard to predict which direction their gravity will end up pushing or pulling you. Drifting into a larger planet or object will make you bounce off and lose a life. Even when it's difficult, the leisurely pace and indirect control method make playing a generally relaxing experience. If you haven't played an Art Style game, or even if you have, Orbient is the one I recommend most. 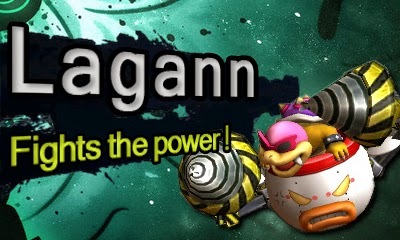 It's fun, unique, challenging, and has a ton of levels. The gravitational controls work well almost all of the time. For being called "Art Style", I do think the game's visual and audio art direction could've managed to be a bit more appealing, but they aren't bad and get the job done. If you like chill, but tough, slow, but precise games, Art Style: ORIBENT is for you. It's pretty darn great and deserves a bit more recognition. 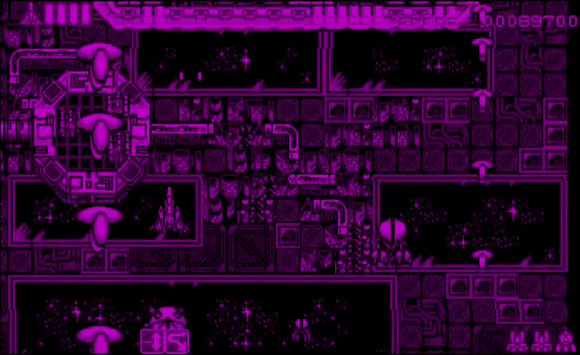 For a similarly chill downloadable game with lots of content, check out Knytt Underground! 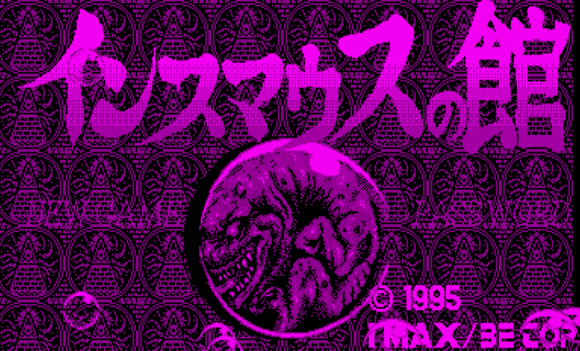 Innsmouth Mansion (インスマウスの館) (Innsmouth no Yakata), more commonly (and incorrectly, thanks to misunderstandings caused by the lack of a "th" sound in Japanese) known as Insane Mouse Mansion or Insmouse no Yakata, is a first person shooter horror game for Virtual Boy exclusive to Japan. 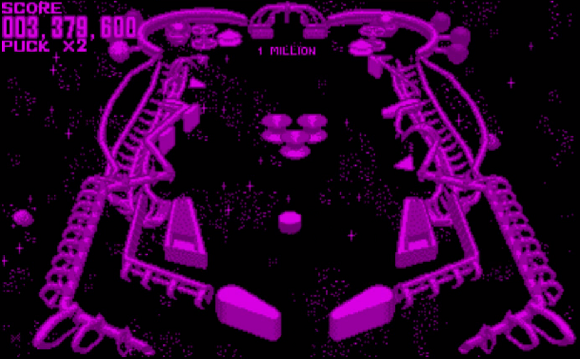 The game is loosely based on H.P. Lovecraft's "The Shadow over Innsmouth" (or, technically, it's based on a movie based on that). I couldn't tell you how loosely since I haven't read that one, but it borrows the name and horror genre at the very least. As far as the horror aspect goes, the only part that is at all scary is the opening cutscene which has creepy jump-scare images flash in front of the screen every few seconds. The actual game isn't particularly scary thanks to the predictable, slow moving, and sparingly animated monsters. Still, while Innsmouth lacks scares, it's surprisingly fun to play. 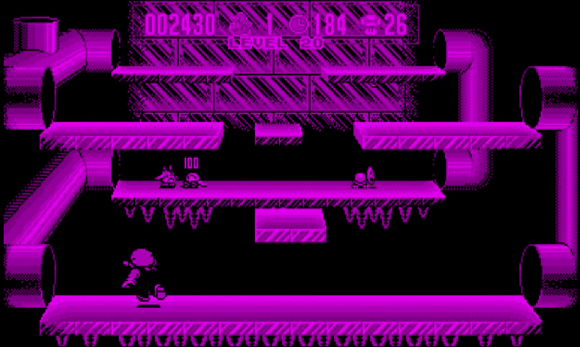 The game consists of exploring mazes of hallways and doors in search of a key which opens that level's exit, all within the time limit. 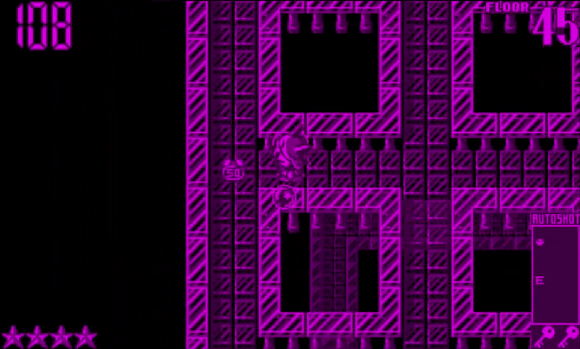 The mazes also have monsters which can block your path and attack you, like I said before, very predictably and slowly. These monsters can be defeated by shooting them repeatedly, but doing that takes up time and precious ammunition, so it's usually a better idea to run away and find another path around the monsters. 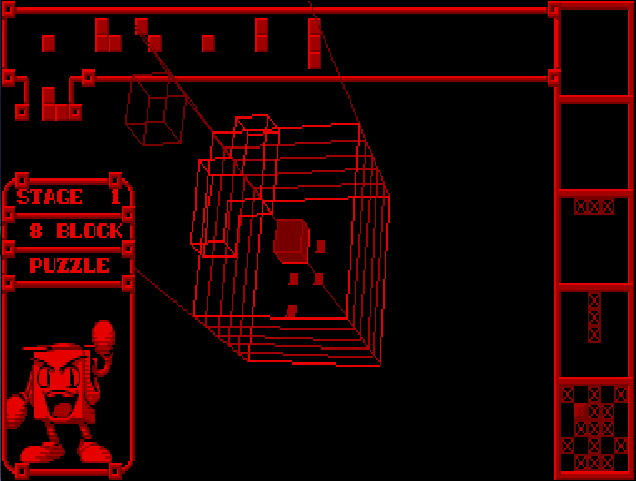 It's also worth mentioning, that aiming with the Virtual Boy's second D-Pad is kind of awkward and certainly not the ideal first person shooter experience. Even if you do kill the monsters, they respawn after a short time, although that's not too big of a deal since you probably won't be backtracking through areas you've already explored anyway. In addition to keys and monsters, each level also has a limited number of ammo refills hidden in plain sight, extra health, and two different orbs which can help direct you. These orbs act like the map and compass from The Legend of Zelda series, with one giving you a map of the current maze and the other showing item locations on the map. If you don't have the map-revealing orb, the map will fill in as you explore it. All of these items are placed randomly in each maze, so much of the fun comes from exploring without knowing where you'll find everything. The map also comes in handy because, unfortunately, pretty much everything and every place looks the same. 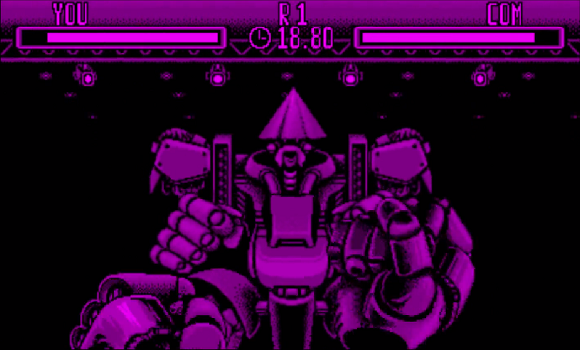 I'm sure the Virtual Boy gives some cool depth to the visuals, but the repetitiveness of the graphics and limited animations of the enemies are pretty underwhelming. The music, similarly, is nothing memorable, but it does set the mood well enough. Even though Innsmouth Mansion is technically a first person shooter, it doesn't have the range of motion and control that you might expect if you're accustomed to modern FPS games. 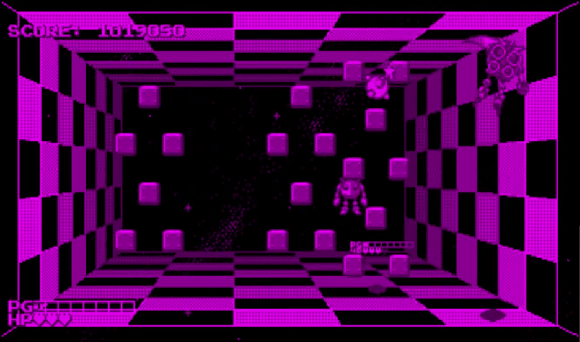 Instead, you move through the grid-based maze one "square" at a time, instantly advancing to the next or previous space when you move forward or back, or by making abrupt 90-degree turns. The only aiming you do is done by moving a cursor on the screen. However, the speed at which you can race down the hallways and switch back and forth from the map screen is gloriously lag free and fast. This speed of movement is great because the game encourages you to go fast, not just with the time limit, but with branching paths of levels determined by how quickly you finish each maze. All these branching levels end with one of four different endings, the best of which requires you to move quickly and also beat the game without dying. If you do die, it's not that big of a deal because there is a password system in place with short, easy to remember passwords for each level. As long as you don't reset the console, you won't even have to type in the password to continue from where you died. And, well, that's about all there is to Innsmouth Mansion - and that's its biggest fault. You can reach an ending in a half hour without ever having played the game before. But worse is that the gameplay is far too simple. Instead of just two orbs and a key to look for, it would've been nice if there were other randomly hidden items and powerups to spice up the gameplay. 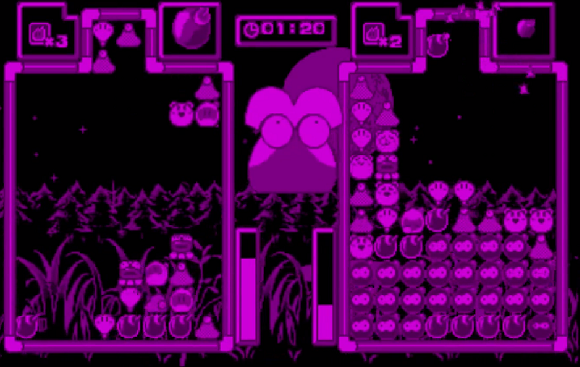 If there were more items, the game's difficulty could also have been increased. Unfortunately, as it is, the game is too bare bones to merit spending much money at all on it. On the other hand, even in its simplicity, Innsmouth Mansion is surprisingly fun to play, and after finishing, I found myself wanting to go back and do it faster. It's not worth buying unless you're a collector, but it's still one of the most fun Virtual Boy games I've played so far. 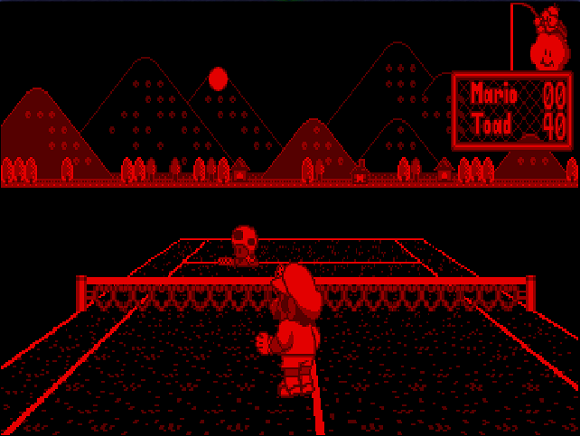 I'm currently embarking on a quest to beat every Virtual Boy game! You can watch me play live on Twitch or catch each game after the fact on Youtube. Disclaimer: Any resemblance to existing characters is all in your imagination. And now for some postcards from Pokéarth.